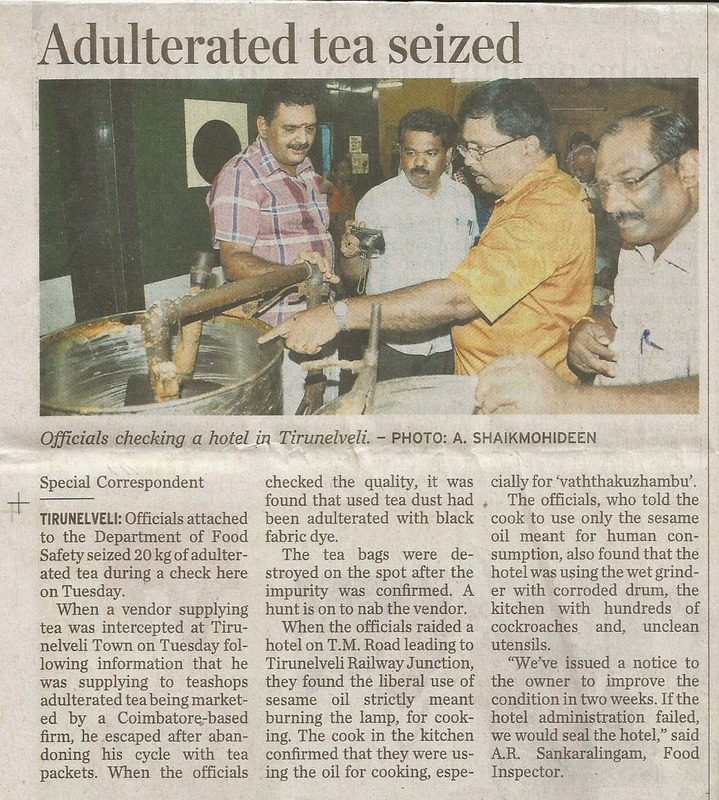 FOOD SAFETY: DARE TO DESTROY THE QUALITY OF TEA! Next time, when you go for a tea, to refresh yourself, will you dare to order for a tea? But the crew cut minded people have dared to destroy the quality of tea dust. How? The Food Safety team headed by Dr.R.Karunakaran, Designated Officer, Tirunelveli comprising Food Safety Officers A.R.Sankaralingam, P.Kalimuthu, M.Kalianandi and S.Ibrahim conducted surprise raids in Tirunelveli Corporation area in the last two weeks. The raids unearthed a huge scandal. To your right is the glass of water added with good quality unadulterated tea and to your left is the glass of water added with adulterated tea. Will you now dare to order for a strong tea? How do they adulterate? 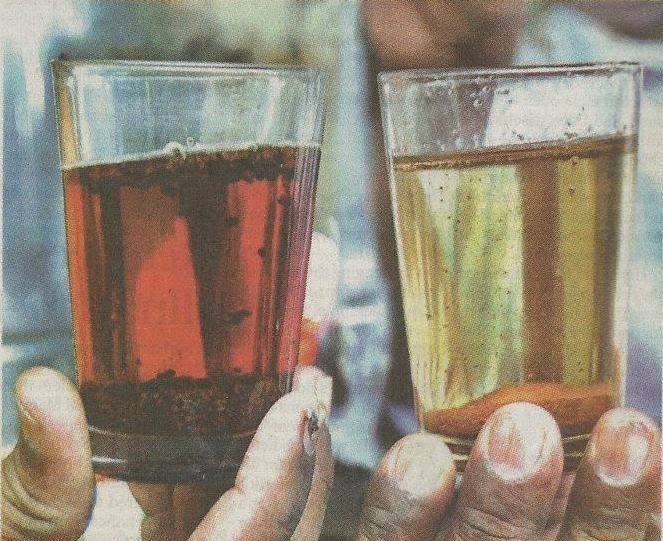 There are some culprits in the society, who purchase the used tea dust obtained after preparing tea from the tea shops,dry it and adulterate the tea dust with artificial dyes to make them bright. Those artificial dyes are highly carcinogenic. 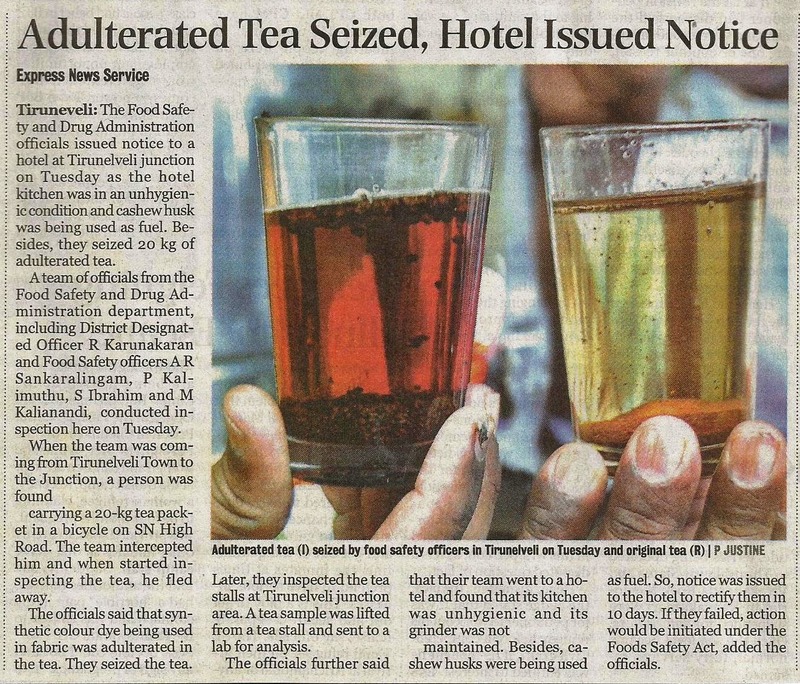 How to detect adulterated tea? Put a pinch of tea dust in a glass of water. Normal tea will disperse from the bottom slowly. The adulterated tea dust when sprinkled over the glass of water will go down dispersing the artificial dyes instantaneously. A famous vegetarian hotel was also raided on that day. We were shocked to see the grinder used to prepare rice batter. The drum was so corroded that you can insert your hand from outside in to the dough. An improvement notice to rectify the insufficiency within 10 days was issued.